I knew it was coming. After two weeks of Peanut Butter Prune Sandwiches for lunch, Brussel Sprouts for Christmas dinner and the total deal breaker – Pickled Beets, my husband uttered the phrase, “This WWII thing is getting old.” In other words, it was time to get out the big guns and make him a believer again. For that, I turned to (cue the heavenly light descending from the clouds and angel chorus) Ice Cream. 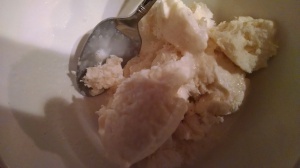 Forget about what you think is ice cream, the rock hard chunk of bland imitation frozen milk bought from a store in a cardboard or — gasp! — plastic bucket. We’re talking real ice cream. Ice. Cream. 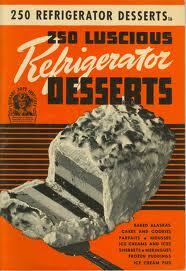 The 250 Luscious Refrigerator Desserts cookbook edited by Ruth Berolzheimer (the Boss of WWII food) was published in 1941 and had to have been state of the art in recipes, considering freezers were still not a common home appliance. To make ice cream one would be using the “freezing tray” of their refrigerator. What I gather is that someone determined the coldest part of the refrigerator and insulated it in a way that dropped the temperature cold enough to semi-freeze some types of food. Among the luscious refrigerator desserts in the booklet are many types of ice cream flavors: Banana Pecan, Honey, Butter Pecan, Chocolate, Caramel, Fruity, Chocolate Chip, Coffee Malted, Orange Pekoe Tea, Prune, Peach, Raisin, Raspberry, Eggnog, New York, Apricot, Cherry, Coffee, Coffee Rum, Maple Nut, Orange, Peppermint Stick, Pistachio and Strawberry. What a minute — Prune? I went for the basic Vanilla recipe. I used no special equipment or rock salt or anything else that has stopped me from pulling off this feat in the past. I vaguely remember making ice cream out of snow in 4-H as a kid; what I remember most is the shaking, shaking, shaking part of it. This recipe requires no such effort. Blend milk, water and vanilla thoroughly, pour into freezing tray of refrigerator and freeze until ice crystals form around sides of pan. Whip cream until stiff enough to hold a soft peak, fold into milk mixture and freeze. When half frozen scrape mixture from sides and bottom of tray, beat until smooth but not melted and freeze until firm. Blend the ingredients all together without reading that you were supposed to wait to add the milk. Beat it with a mixer hoping it will whip up. After three minutes of hoping and wishing, pour it into a plastic tray (like the skinny kind that comes with the refrigerator – they are narrow and you know they fit perfectly into the shape of your shelves). Leave it in the freezer for about thirty minutes while you walk the dog. Pull it out of the freezer and pour it into a bowl hoping you can still whip it up into soft peaks after it has chilled a bit. 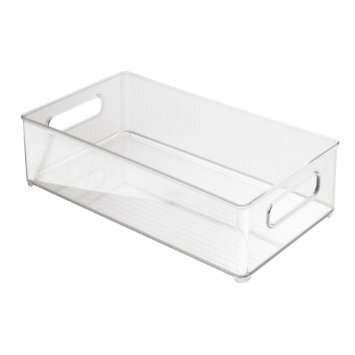 Become a little bit sad and worried about it turning out and just dump it back into the plastic tray and put it in the freezer. Wait three hours – or two hours if you’re like me and that’s all you can take. Scoop out and enjoy like you’ve never enjoyed ice cream before. For added assurance that my hubby would be okay another week into this project, I whipped up a Chocolate Sauce for topping from the Meal Planner I have been using all along. Seriously, folks. If you’ve ever had Coldstone Ice Cream, this is even better. Next up I will be making the Peppermint Stick flavor since wasting anything is not allowed in 1943 and those broken candy canes from Christmas have to be used somehow. All I will do is omit the vanilla and add the crushed candy cane after the ice cream takes its second beating. So there you have it — how to make your husband chill on a WWII food project.